Flowers are an important tradition at any wedding. 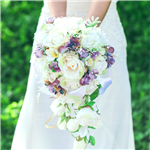 Our florists serve the Las Vegas area and can help you with beautiful arrangements for your big day. From the moment you walk down the aisle with beautiful floral bouquet in hand to the trendy flower centerpieces on your tables at the wedding, flowers and blooms are the finishing touch. You will want to pick the perfect petals from your bridal bouquet to the groom's boutonniere to the flowers garlanding over your wedding gazebo. When you attend The Bridal Spectacular you will find many “cutting edge” wedding trends in flowers and the wedding florists that can provide them for you. A Touch of Class - A Touch of Elegance Specializing in silk flowers for your Wedding Venue, Receptions, Bouquets, Corsages, Boutonnières, all of your Decorating needs. A Touch of Silk will make all of your dreams and visions of your special day come true.